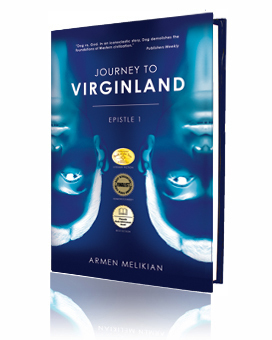 In Journey to Virginland, his debut novel, Armen Melikian continues the celebrated tradition of Lebanese writers in tackling universal themes and raising the voice of dissent. Lebanese writers, among them Gibran Khalil Gibran, have long transposed the unique cosmopolitan sensibilities and intellectual openness of their homeland into uncommon works of art and literature, which are often marked by a daring knack for exposing the sacred cows, a dedication to social and political justice, and, perhaps most remarkably, a quest for spiritual concordance. Among today’s Lebanese writers, Melikian has fast earned a place of distinction after the publication in 2012 of his Journey to Virginland, which is the first installment, or Epistle, of a trilogy. The son of Armenian immigrants, Melikian was born and raised in Lebanon. He left his native land at a young age, intent on experiencing the world on his own terms. His ensuing life trek went on to find expression in Journey to Virginland, an ambitious, encyclopedic novel in which philosophical and religious inquiry, sociopolitical critique, and meditative moments are eminently calibrated with the worldly adventures and travails of Dog, the protagonist. Melikian’s novel makes an impassioned bid for enlightenment vis a vis a fast-shifting global paradigm. Furthermore, the book enriches the legacy of Lebanese writers by often bringing to the mix a fiercely witty approach to his overarching themes, ultimately placing his work in a league all its own. Looking for novels by Lebanese writers? Get your copy of Journey to Virginland today!